Suggested levels for this lesson are any grades. The understood concepts and art making activities will be more sophisticated with the older age of the participants. In this lesson students are introduced to urus, which are functional art forms of the Huicholes. 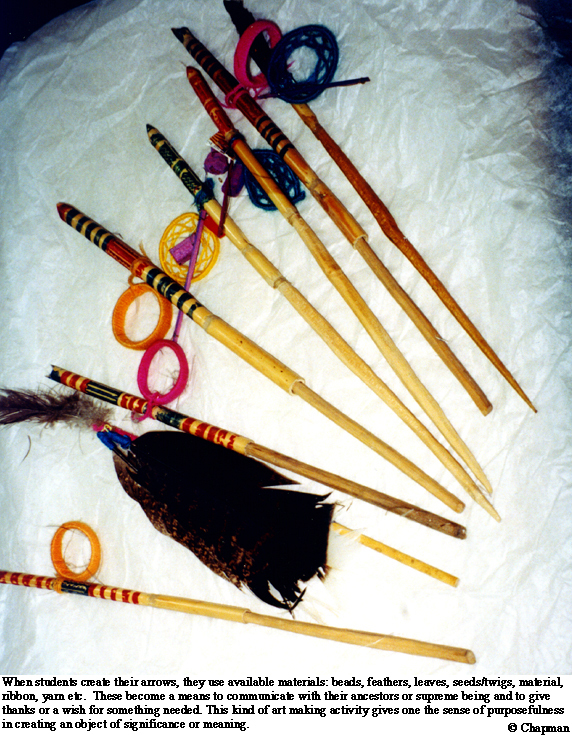 These "arrows" are made of painted, patterned sticks that are highly decorated with feathers, "ojos de Dios"("eyes of god"--yarn weavings) , woven rings, and pieces of embroidered cloth. All these decorations are individual symbols definitive of a particular wish. These arrows (muviere) are then left at a holy place, or sent into the wind, or floated down rivers as prayers. The wishes are thus sent into nature to find their fulfillment and restore balance. Students will learn to create their own "I wish" arrows using materials symbolic of their own individual or community wishes. Huicholes have many different art forms that are functional. The gourd bowls jicara are used as offerings to the deities-refer to Lesson 2. The decorative, woven bags that the men wear around their waists are used to carry personal objects-Lesson 4. 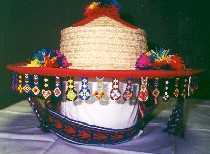 Also, decorated hats are worn to protect them from the sun. Urus are examples of Huichol functional art. Urus are highly decorated arrows used to send individual/communal wishes into nature, similar to metaphorical phones. The main shaft is made from oak, with an overlay of bamboo starting at the top. Decorative materials like feathers, string, small embroideries, etc. are attached. Everyone in the ranchos creates urus. Children begin at a very early age to design and make their own. 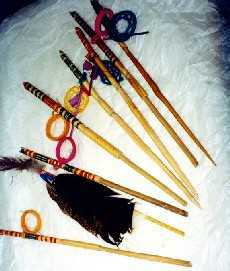 They are used in children's ceremonies. Feathers are usually tied to the top of a urus directly onto the bamboo. 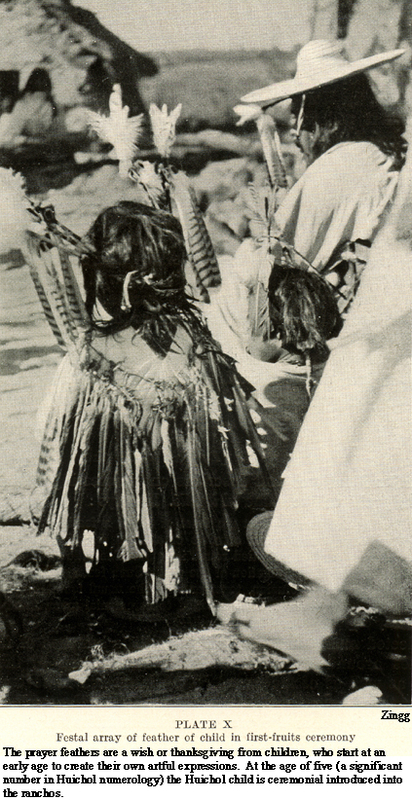 Huicholes believe feathers to be a direct method of communication to nature. The arrows "fly" these wishes into nature in order that they are heard by Huichol deities and the situation will be brought back into balance. 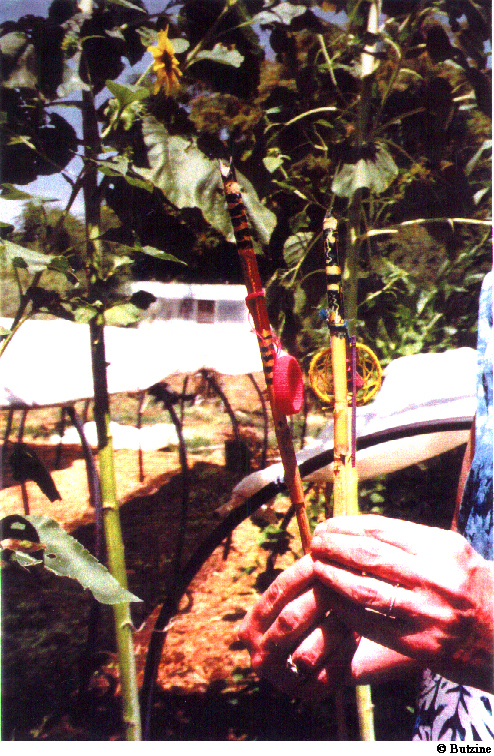 Other beliefs of the Huichol are that wishes are thoughtfully conveyed to the top of the arrow and the arrow placed in nature (top up). When the rains come the wish is coated with rain. As the sun warms the arrow the moisture at the top of the arrow evaporates,	carrying the wish into the heavens via the metaphoric phone line. 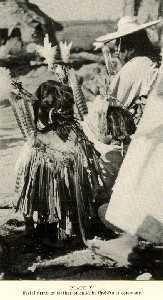 The wishes of the Huicholes may be personal or communal. Wishes may include good health, good harvests, rain to alleviate drought conditions, and bountiful material goods. ...to make their own "I wish" arrows using a variety of materials. The addition of strands of beads and personal trinkets is a good way to personalize the "I wish" arrows. Small pieces of fabric with embroidered symbols or painted designs can also be attached. 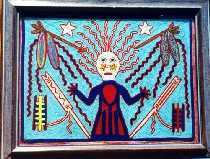 ...to create their own symbols by assigning different (personal) meanings to the materials, colors, and patterns used in the decoration of their arrows. ...art making can also serve a functional purpose as a means to illustrate wishes. ...wishes do not always concern individual desires but may include the entire community, asking for Peace or Prosperity for the family. ...their, "I Wish" arrows have value in the community where they live. Begin by asking the students to describe the urus (arrows) seen in the accompanying images. What materials are they made of? What are their designs? What persons within the village create them? What is their purpose? Have the participants share their answers after they have written down their initial replies. At the end of the lesson ask the same questions to assess student learning. Have them share their answer with the other participants. Explain that arrows/urus are used in children's naming ceremonies. Explain that these arrows are decorated with objects, patterns, and colors that are symbolic of particular wishes of the artist. Explain further that a wish may be used in order to reestablish balance within a community and in nature. For example, drought is considered by the Huicholes as nature out of balance, and urus may be sent to restore that balance. Read the book, The Eagle and the Rainbow, to the younger students. Have the older students read the story out loud and discuss each page. Ask the students to explain how the hero, Fast as Deer, restored the balance of the community. He sent arrows/urus into the four directions. The fifth direction is the sacred point of union for all four points to unite with the heavens. Ask also what was the sign that the community was out of balance (drought, death, and dying and because Fast as Deer was originally denied his name that the shaman/leader originally assigned him). Explain to the students that Fast as Deer wished to restore the community balance by making and sending the arrows into the four directions. Tell the students that by focusing on their own wishes, they too may change conditions towards their own important desires. Show the students some examples of Huichol urus, pictured in this lesson. Ask the students what their own wishes for themselves and their community might be. Using pre-cut sticks, have the students decorate these with symbols defining their own particular wishes. Use feathers, colored ribbons, charms, objects from nature, strings, beads, cloth, and written wishes to decorate their arrows. 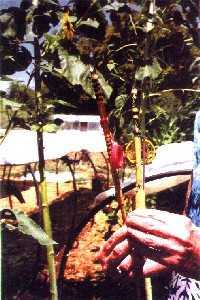 Direct students to tie written wishes with ribbon or string to the stick. Such wishes may include "I wish it would snow, I wish there was no hunger in the world, I wish there was world peace, I wish there was no poverty, I wish... et al." Have the students think of special places where they may place their sticks, so they are reminded of their wishes. Exhibit the I wish arrows in a community location along with the written wishes. This could be in the lobby of the school. Have the participants share the places where they will place their "I Wish" arrows. It is hoped that a field trip to The Bead Museum can be included in this lesson.